In the last 3 or 5 years, a content marketing plan has become an integral part of any traffic-generation campaign. Agencies offer this service because they know its long-term ROI on SEO, as well as brand authority. Creating a content calendar is the initial output presented to clients. But before diving in, let’s discuss first what goes into the content creation process. 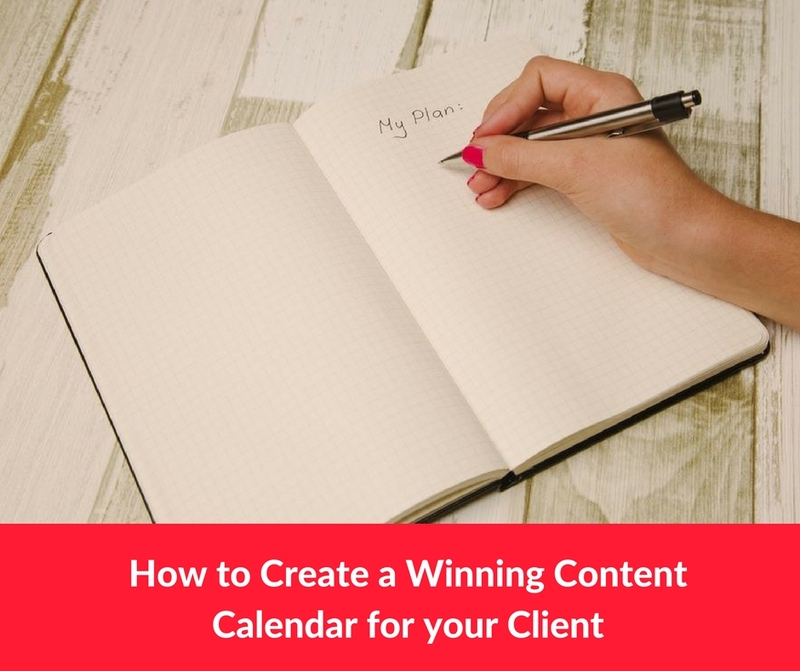 How do you actually create a winning content calendar for your client? 7) Setup the content calendar schedule: Download Free Template here! Do your assignment and spend a week or two on research to understand the industry they’re in – the key players, the audience and their behavior, buzzing issues, published content, and so on. This is important because this helps you find out the type of content marketing strategies their audience would most likely respond to. What pulls their strings? What resonates with them? Also, take time to study the client’s marketing brief. This first step will help you see the big picture and where the client stands in the full ecosystem. After sufficient research, now is the time to define your ideal users/customers, or target personas. You can do this by interviewing the customer-facing team: Support, Sales, Marketing teams, etc. Ask them questions about the usual type of customers they encounter: their interests; what they value/what they look for in their product or service; their demographic and lifestyle, pain points, etc. Personas provide a human depiction of the audience you will be communicating with. Understanding their unique behaviors, motivations, as well as pain points, will help you identify which stage of the funnel they’re in, and what type of content they are thirsty for. Doing this step not only provides additional information about their product/service – it also gives you an idea of their brand voice, the type of content they publish, the stage in the funnel that lacks content to support it, and which content pieces generate the most engagement and conversions from their audience. Put them in one place so you have a baseline for improvement. Additional Tip: Worthwhile to study or set the tone or voice of the brand for communication consistency. 4) Establish the goal of each content piece. Establishing the client’s conversion funnel helps you determine the kind of content each stage requires. This, in turn will enable you to pinpoint the goal of each content piece that you publish. Awareness – pertains to content geared towards user acquisition (or traffic). Consideration – content that showcases what sets them apart from competitors. Case studies work great for this stage of the funnel. Conversion – this stage caters to users who have put one foot inside the door. Just a little more push and they’re ready to convert! Send them a newsletter via a drip campaign. Retention – what type of content will enhance brand loyalty? Product updates and customer incentives are applicable for the retention stage. Remember: Knowing your content goals will keep you aligned with the right content marketing metrics to measure, as well. Advocacy – This is the final stage of the funnel and probably the most challenging one. It involves turning your client’s loyal customers into advocates! It happens when the brand becomes their own personal experience that they’d want to share it to friends and family. Harping on your most outstanding brand values can help you create advocacy campaigns for your client. What is the aspirational goal of their brand? Is it work-life balance? Financial freedom? Ask them out. Do not skip this oldy’ but trusty’ step of the process. While some content writers would probably be lenient on keyword research, consider this the backbone of your content marketing plan. If personas capture demographics, keywords on the other hand, represent their search behavior. Remember when Google introduced micro-moments? There is no other way to capture that special moment when your users are earnestly seeking you, but through using their search terms (especially on mobile). Establish your content themes, first. Personas’ interests, client’s product information, seasonality, and funnel stages will help you define content themes. Ex: Baking Chocolate Pastry. Check your competitor’s keywords (both organic and paid). You can use SEMrush or SpyFu. Pick out the most relevant keywords, at the same time the low-hanging fruits (considerable search volume with less competition). Sample keywords for the content theme: Baking Chocolate Pastry could be, “moist dark chocolate cake recipe”. Take note: Intent has to be incorporated into your keywords (i.e. “how to bake chocolate frosting”). And user intent varies per stage of your funnel (see Step 4). Here’s my favorite part – outperforming the competition! While it can be a tall order, it’s really fun spying on what others have published. Find out what your client’s competitors are up to. Study their content marketing examples. Just do a simple Google search using a content theme, keyword, or a proposed blog title, and you’ll probably see a list of similar articles published online. It’s great if no one ever thought of writing about your topic, but if there are existing ones – don’t fret! Use it to your advantage. See what goes into the top content pieces – do they have statistics? Images? Links to research studies? Testimonials? Think about how you plan to write it out. What can make your piece add more value than what’s out there? Goal: Stand out from the noise and be the go-to source! 7) Setup the content calendar schedule: Free Template! I’m sharing a content calendar schedule template you can keep or tweak according to your team’s needs. You can also classify your content pieces into 3. This offers you some variety in conceptualizing content ideas (without pulling your hair!) for each of your clients. Custom Content – content pieces that is unique to your brand (i.e. Thought Leadership articles). Curated Content – these cover industry news, trends, issues about your client’s market. Outreach is the process of amplifying your content. This part of the content marketing process became a buzzword in 2015, but it is believed to have been in motion ever since marketing began. The goal of outreach is to get the right content to the most number of relevant users or audience using a variety of tools and strategies. Some prefer reaching out to “influencers” to vouch for their content. Others opt to join focus groups (i.e. Linkedin or Facebook groups) where like-minded individuals are more receptive to content that resonates with them. Some marketers continue to depend on email newsletters because email is not dead, especially when it is highly personalized, and segmented. Whatever your choice of outreach, it’s important to look back to your target market and find out where they can be found; who are the individuals who most influence them (influencer marketing); and which media do they highly consume (email, social, mobile, etc.). A winning content calendar is not a mere list of blog topics. It is a well-thought out, well-crafted content strategy that will definitely be appreciated by your client. If you have questions about this process, or needs more information, send me an email at: mail@romeladeleon.com. Read more about my content marketing consultancy service.